The 2 Litre Approved Sharps Container is primarily designed to be used in places such as public toilets or in areas known to be frequented by needle users, this container provides for the safe disposal and subsequent removal of contaminated sharps, thereby removing these items from being a public hazard. 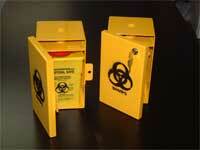 The container is robust, steel lockable and features a removable plastic liner for transport of sharps. The GOTCHA is a mechanical device approximately one metre in length with a spring and trigger operated pair of pick up jaws that enable potentially hazardous or unsavoury items to be picked up and placed in a suitable receptacle. Relatively inexpensive , this item safeguards health workers and cleaners from the likelihood of needlestick injuries when clearing contaminated areas. 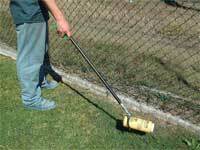 A must for any `Cleanup crew’. Sharps Container - Suitable for public areas where the disposal of sharps is a priority, this approved container features a non-returnable loading lid where either a single syringe or a 2 litre disposal container may be placed. Inside, a lockable steel liner is in turn lined with a contaminated bio hazard waste bag. This liner once covered and locked, can safely be used to transport the contents to a point where they can be correctly destroyed. 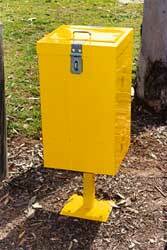 The Sharps Container can be wall mounted, or fitted with a free standing pedestal. Normal colour is Golden Yellow.